My parents are really religious. In a way, I’d rather tell my parents I was a murderer. AROUND A QUARTER of a million people in Ireland officially register themselves as atheists. According to the 2011 census, 256,830 claimed not to have any religion. That figure marks over 6% of the Irish population, making atheism the second most popular classification in the country. As the country becomes more and more secular, that number is expected to rise, but what is the experience of telling a religious family that you don’t believe in God? 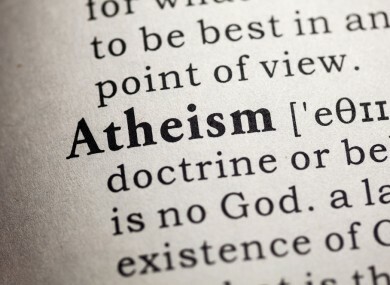 At its core, atheism is the lack of belief in a deity or, largely, in organised religion. While it is marked by the absence of belief, in recent years many organisations have moved to make it a positive thing. Atheist Ireland for example have run campaigns aimed at repealing Ireland’s blasphemy laws, establishing non-denominational schools or running secular charities. Some, however, simply don’t believe in God. In Ireland, atheists can still be fired from teaching and nursing jobs in religious institutions. This is done under the same legislation that makes it possible to summarily sack gay and lesbian workers. This makes it difficult for many teachers and health workers to raise the issue with co-workers, but many don’t find it too difficult, choosing not to “rock the boat”. However, for Mark* his experience has been different. When he mentioned to his mother that he was feeling some doubts about his faith, her reaction made him stop in his tracks. “I was about 15 or 16 and I’d been going to mass every week in a small rural town. I found that I didn’t connect with what was being said and, to be honest, I just didn’t believe it. “When I mentioned that to my mam, she brushed me off in a really strong way. I got the message that I wasn’t to talk about it, especially in front of my mam. “So I swallowed it. I went to mass until I went to college and moved to a city. “Now I’ll go to mass at Christmas when I go home, but if I’m there for the weekend, I’ll make sure that I have an excuse ready for Sunday morning like getting on the road to be back early, just to avoid it. Christopher*, another atheist, says that he attends christenings and weddings “out of politeness”, but his family are more accepting. “My mam would have been a little put out when I said I wouldn’t baptise my kids, because she equates morals with religious beliefs. “Other than that, it’s fine. Email “What is it like to be an atheist in Ireland?”. Feedback on “What is it like to be an atheist in Ireland?”.